This month I tweaked many things and added or removed many bits and pieces, and the effect is amazing. This version of Path of Adventure is by far the best. Being the core of the game the battle system has seen many rounds of tweaking, but this time I truly believe this is the last. Overall, the weapons have become weaker, moving focus towards the stats of the character. Enemies have lower attacks too, making the take hit/dodge a serious option again. Also blocking with swords is now a viable way to defend. Each enemy has a clear characteristic; high defense, attack, or speed and thus requires a different weapon or tactic. There are no more harmful mushrooms; it’s always safe to try one. That’s not to say that it will be useful to eat the mushroom in the current situation. Eating a mushroom costs life. The price starts with just 1, but is increased by 1 with each mushroom eaten. And there you have it, a nice balance between two powers. There’s only an x amount of mushrooms you can eat before they get too costly. 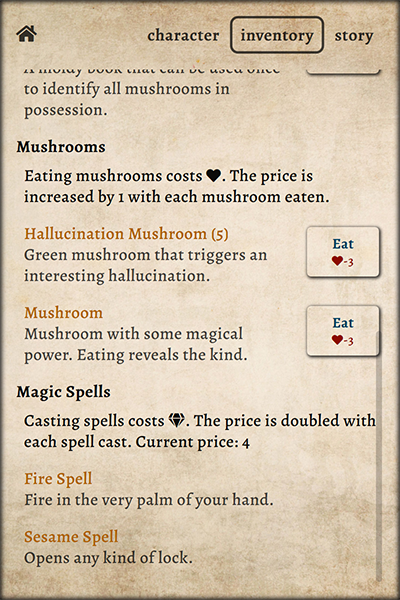 On the other hand, you want to know what mushrooms you have in times you desperately need one. Spells used to cost life too, but that didn’t work out very well. 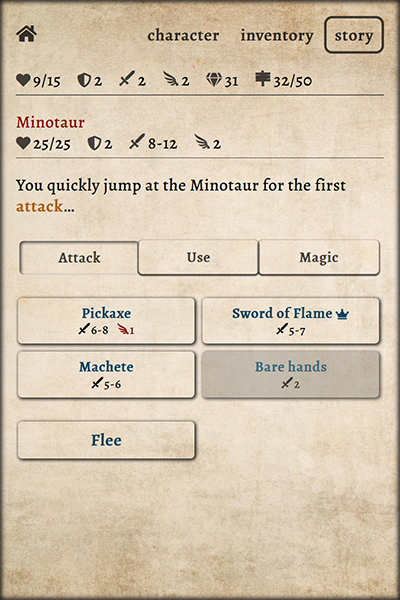 Most spells are used in fighting situations (they alter enemy stats) and that’s exactly when you haven’t much life to spare. So now casting spells costs gold. The price starts with just 1, but is doubled with every cast. It’s a bit like mushrooms, but with spells you know what you have, you just have to try to save them for the really dire situations. Plus, it’s now also important to keep some gold in your pockets and not buy every shop empty. I ditched the chapters and created one long path of 50 steps/days, and introduced a stat to show the progress. At the start you receive a random set of weapons and items. Early on you are informed about what type of boss waits at the end (there are 3). There are 2 in-between bosses that are also randomly selected out of 3 options. There’s an event for each where you can buy info. 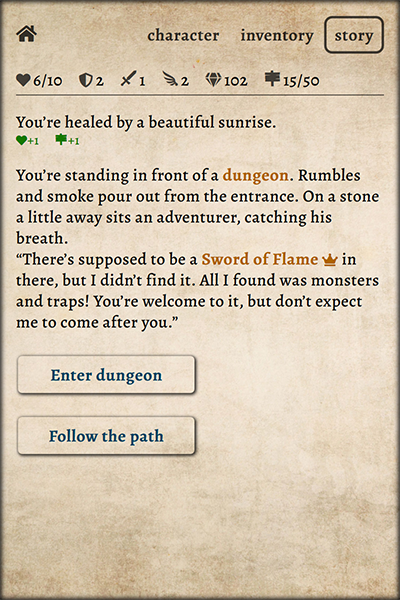 It’s now made clear what reward lies in dungeons and ruins; allowing you to make an informed decision. A new ending: defeat the end boss. The trick is that it will flee up to 2 times. And after it flees, you have to go through a dungeon passage to catch up with it again. It’s a nice combination of fighting and traversing dungeons. When the game is finished the remaining gold is the score. Added more story to give meaning to the things you do.